Rocks are no match for your machine while you’re cattle farming, as long as you have the rock bucket attachment on hand. This bucket is ideal for sifting and sorting through rugged material. 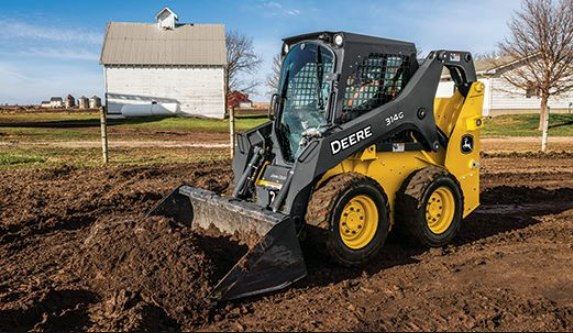 It can clear stones and remove debris as necessary, all while you work directly from your cab. Digging is no longer a hassle with the rock bucket on your machine. Rounded bale spears give you maximum visibility as you use the attachment for all of your baling needs out in the field. With the bale hugger attachment, you can also lift, move, and stack round or rectangular bales up to 2,400 pounds. With these attachments, you can make it so your tines easily penetrate pen-packed material. In turn, this makes for quick and easy cleanout, saving you time on the job and boosting your overall efficiency. The tine spacing and one-piece top clamp are designed to firmly grip hay and manure as well, making these attachments ideal for your cattle farming needs. The side discharge buckets are a must-have for cattle farming professionals who work regularly with sand, sawdust and straw. They can easily spread material in livestock stalls, increasing productivity on the job. In addition, the buckets can be used to backfill gravel into trenches and precisely place landscape mulch. Rotary tillers are essential for all cattle farming workers who are going to be handling rugged material. They have heavy-duty tines with a tilling depth up to six inches for even the most challenging terrain. In addition, they operate in two different directions for more efficiency. If you have any questions on John Deere cattle farming attachments, contact your local John Deere dealer.